This rare Yellow tea comes from the misty peak of Mount Meng, where tea cultivation dates back to the Han Dynasty more than 2,000 years ago. Meng Ding Huang Ya was an Imperial Tribute Tea during the Tang Dynasty and was recorded in many famous Chinese books. Only the leaves picked in the misty peak areas of Mount Meng can be considered as true Meng Ding Huang Ya. The tea is grassy in nature but with hints of nutty and sweet taste and fragrance. A sensational and unique tea experience. 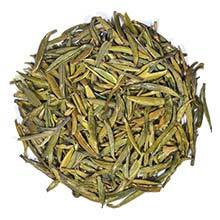 The beautiful and tender yellowish green tea leaves are perfectly made. The leaves point straight up during infusion.